Nonwoven fabrics are made directly from fibers, bypassing both yarn-spinning and weaving, or knitting. Although technically fitting this description, the age-old fabric, known as felt, is not considered to be a nonwoven fabric. Specific definitions of materials that can be termed nonwovens are given by the Association of the Nonwoven Fabrics Industry (INDA) in the United States and the European Disposables and Nonwovens Association (EDANA). Nonwovens must have a fabric density of less than 0.4 grams per cubic centimeter. Felt, made from wool fibers that are entangled by heat and moisture, is usually much heavier. Another property of a nonwoven textile is that over 50 percent of its weight must be fibers with a length-to-diameter ratio of at least 300. This eliminates paper, which is made of very short fibers. Nonwovens are often called fiber webs to distinguish them from these other materials. Properties of nonwovens are particularly dependent on the fibers and processes used. General properties are a lack of drape and an inability to shear where yarns cross over, as in woven fabrics. This often makes them stiffer and less stretchable. They are also weaker than woven and knitted fabrics. Nonwoven fabrics are often classified by the production processes used to make them. The two major steps in production are web formation and bonding. Each step has a number of variants, and the combination of web forming and bonding method determine a nonwoven's properties and ultimate end-use. There are several ways to form a fiber web. The traditional method is carding (also called dry laying), in which short, discrete, length (staple) fibers are pulled through wires to align them. This is the same process that is one of the steps in spinning yarns from staple fibers. Staple-fiber webs can also be made by air laying, where the fibers are suspended in air and collected on a moving belt; and by wet laying, a process similar to paper-making, where a mixture of fibers in water is collected on a screen, drained, and dried. A disposable diaper comprises several different non-woven fabrics. The inner liner is a spunbonded web, the outer layer is a dry-laid web bonded to a plastic film that prevents liquid from flowing through. The interior layer is a web of wood pulp and a super-absorbent fiber. There are also stretchable nonwovens in the tabs and other sections of the diaper. Webs can be formed from long continuous (filament) fibers as well. In these processes, spunbonding and meltblowing, melted polymers are extruded through many small holes and cooled and collected on a belt. The fibers in meltblown nonwovens are finer than those in spunbonded fabrics because high-velocity air is blown on the fibers as they are extruded, drawing them down to a smaller diameter. Most webs formed by the methods described have little structural integrity, being a collection of fibers with mainly physical entanglement to hold them together. Subsequent bonding of the fibers is therefore necessary to provide that integrity. Bonding techniques used for dry- and wet-laid webs are adhesives, solutions, or heat, needle-punching, spunlacing, and stitching. Adhesives are glues that are sprayed or padded onto the webs. Alternatively, substances that dissolve the surfaces of the fibers can be applied, and when the dissolved surface areas dry, the fibers bond. A similar type of bonding can also be induced by heat if the web is composed of fibers that melt. The heat melts the fiber surfaces producing "thermal" bonds upon cooling that hold the fibers together. Spunbonded and meltblown nonwovens thermally bond when the fibers cool after being extruded. Passing the web through heated cylinders, called calender rolls, bonds them more completely. Needle-punched nonwovens have been subjected to a process in which a set of barbed needles moves in and out of the web, entangling the fibers. Spunlaced nonwovens have a distinctive, almost lace-like, appearance because they are produced by passing the web over a set of high-force water jets to entangle the fibers. Small holes are produced where the water penetrates the web and fibers become knotted and entangled around the holes. A final method that has been used to bond fiber webs is simply stitching through them with thread. Many nonwoven textiles are destined for industrial uses, such as geotextiles for road reinforcement and ground and soil stabilization, roofing and insulation, dust cloths and wipes, home furnishings, and filters. They appear in garments and other wearing apparel as either durable or disposable products. 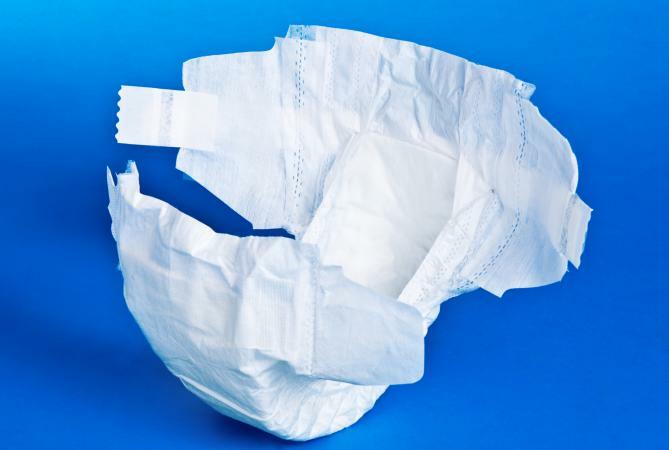 One of the highest-volume disposable products is diapers, which have all but replaced cloth diapers in many countries. Nonwoven textiles are also used in other disposable items such as wipes, feminine-hygiene products, incontinence pads, surgical and medical examination gowns and masks. Surgical and other health-protection masks are often made with meltblown nonwovens that have good filtration properties due to the very fine fibers. An issue with all these disposable non-woven products is lack of biodegradability and build-up in landfills. Some can be recycled; but, as can be imagined, recycling many of these items presents significant problems. In addition, since they are low-value, high-bulk, recycling is usually not economical. While a great number of nonwoven textiles are disposable, there are end-uses in which a certain degree of durability is desired. An early and continuing use of such nonwovens in clothing was as interfacings and interlinings. Interfacings are placed within garments to stiffen areas such as collars, cuffs, lapels, waistbands, and parts with buttons and buttonholes. Nonwovens, due to their resistance to shearing and stretching, help to stabilize these areas. In many cases the nonwoven interfacings have heat-activated adhesives on their surfaces so that they can be thermally bonded to the outer fabric. Non-adhesive nonwovens can be included in garments to provide insulation. New stretchable nonwoven textiles are being made for use in foundation underwear and some sportswear. Oldrich, Jirsák, and Larry C. Wadsworth. Nonwoven Textiles. Durham, N.C.: Carolina Academic Press, 1999.